Two were killed and six others injured Sunday in a car accident involving three vehicles, local police said. 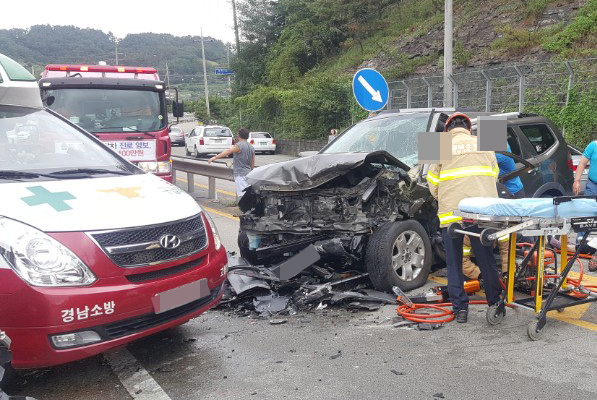 The accident occurred at around 1:10 p.m. when a Mohave SUV veered across the median line and clashed into a Sorento SUV coming from the opposite side on a local road in South Gyeongsang Province, according to police. Another vehicle later rear-ended the Sorento. The 67-year-old driver and a passenger in the Mohave were killed. The 43-year-old driver of the Sorento was whisked to a nearby hospital and is said to be in a critical condition. Five others were also hospitalized.